Learn how to use the New Relic platform Alerting tool to monitor performance and recognize when leading performance indicators spike or drop so you can catch problems before they reach your end user. Enable team members to get the alerts they need faster and achieve lower response times. Analyze data and features in the incidents overview page and identify critical information about recent events. Understand the incident life cycle. Create, edit, and configure alert policies and notification channels about situations that matter most to you. Learn how to manage notifications and events for many New Relic products in a single, easy-to-use, centralized alerting system. Learn how to create and manage alert policies that fit your environment and focus on the metrics you care about most in a simple, intuitive way. 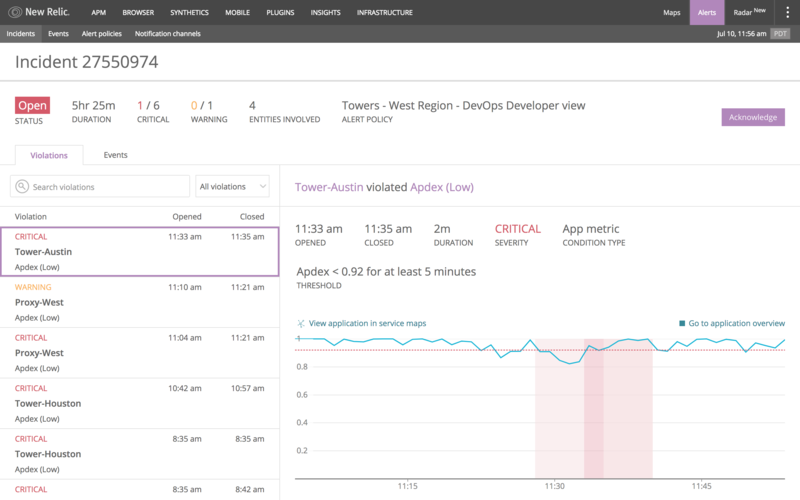 Learn how to use New Relic's Alerting Incidents to see the big picture and respond to performance problems in a more wholistic and productive way. Learn how to create and manage notification channels so team members can get the alerts they need faster, and achieve lower response times. Knowledge check for New Relic Alerting.